For patient education resources, see the First Aid and Injuries Center, as well as Broken Arm. The dorsal metaphysis of the distal radius is subject to tensile and compressive forces during routine forearm activities. The volar surface transmits higher compressive forces. Stable reduction of the DRF requires that this biomechanical relation be reestablished. Accordingly, the volar buttress must be addressed first in unstable volar fractures (eg, volar Barton fracture, DRF with significant volar comminution). In the presence of volar comminution or inherently unstable volar vertical shear fractures, the key to stable fracture reduction is to create a solid volar buttress either by accurate reduction of large volar metaphyseal fragments or by placement of a volar buttress plate. Once volar stability is restored, the dorsal metaphyseal fragments can be reduced against the stable volar buttress. Restoration of volar stability also has important radiocarpal implications because the stout radiocarpal ligaments are attached to the volar surface. Therefore, volar integrity is critical for the following reasons: (1) it allows reduction of dorsal metaphyseal fragments against a stable volar buttress and (2) it prevents possible radiocarpal instability. Studies have shown that DRFs often are associated with tears of the triangular fibrocartilage complex (TFCC), scapholunate ligament, and lunotriquetral ligament. [8, 9] Geissler et al found that intracarpal soft-tissue injuries occurred most frequently with fractures involving the lunate facet. The lunate facet and its strong ligamentous attachments with the proximal carpal row and ulnar styloid form the medial complex of the distal radius as described by Melone (see the image below). The carpus almost always is displaced with the palmar and/or dorsal lunate facet die-punch fragment of the distal radius because of the exceptionally strong ligaments of the medial complex. The medial complex, as described by Melone, consists of the lunate facet and its ligamentous attachments, especially the strong volar ligaments. Displacement of the medial complex has important functional implications. In general, the authors do not treat carpal ligament injuries (including TFCC injuries) occurring in association with DRFs that do not show visible deformities on plain radiographs. The authors believe that with accurate fracture reduction, the ligaments heal during the postoperative or postreduction immobilization period. However, whenever an external fixator is applied, it must be used for neutralization only because excessive traction can displace or complete undiagnosed partial carpal ligament tears. The typical mechanism of a dorsally displaced DRF is a fall on an outstretched hand. This type of injury results in tensile forces across the volar surface (compression side), compressive forces on the dorsal surface (tension side), and supination of the distal fracture fragment. In the young adult, DRFs are often caused by high-energy trauma. In the elderly patient, low-energy trauma, such as a fall from a standing height, can result in this injury. Compression and torsion across the articular surface can cause various patterns of intra-articular displacement. Dorsal and palmar shear fractures of the medial complex are examples of compression applied to specific locations. Radial styloid fractures can be due to compression and/or torsion. Fractures of the distal radius are not simple injuries and, thus, require careful evaluation of the radiocarpal joint, the distal radioulnar joint (DRUJ), and the carpal bones. However, educated decision-making based on objective data and patient profile can lead to optimal outcomes of these challenging fractures. The prognosis is dependent on the functional expectations of the patient; accordingly, anatomic restoration of the distal radius and early radiocarpal joint mobilization are important for patients with high functional demands. In a study by Clayton et al, a high correlation was identified between bone mineral density (BMD) and the severity of DRFs. In patients with osteoporosis, the probability of early instability was 43%; that of late carpal malalignment, 39%; and that of malunion, 66%. In patients with osteopenia, the probability of early instability was 35%; that of late carpal malalignment, 31%; and that of malunion, 56%. These findings compared with a 28% probability of early instability, a 25% probability of late carpal malalignment, and a 48% probability of malunion in patients with normal BMD. Koenig et al evaluated whether early internal fixation or nonoperative treatment is preferred for displaced, potentially unstable DRFs with initial adequate reduction. They found that internal fixation with a volar plate provided a higher probability of painless union for potentially unstable distal radius fractures. In most cases, long-term gain in quality-adjusted life years outweighed the short-term risks of surgical complications, making early internal fixation the preferred treatment. In patients older than 64 years, however, nonoperative treatment may be preferred because of lower disutility for malunion and painful malunion outcome states. In postmenopausal women, detailed bone structure and strength measurements provide insight into the pathogenesis of forearm fracture, but femoral neck area BMD provides adequate measurement for routine clinical risk assessment, according to Melton et al. Fracture cases had inferior bone density, geometry, microstructure, and strength. The factor of risk was 15% worse in patients with forearm fracture. See also the Fracture Index WITH known Bone Mineral Density (BMD) calculator. Jerrhag D, Englund M, Petersson I, Lempesis V, Landin L, Karlsson MK, et al. Increasing wrist fracture rates in children may have major implications for future adult fracture burden. Acta Orthop. 2016 Jun. 87 (3):296-300. [Medline]. [Full Text]. Lashin H, Davie MW. DXA scanning in women over 50 years with distal forearm fracture shows osteoporosis is infrequent until age 65 years. Int J Clin Pract. 2008 Mar. 62 (3):388-93. [Medline]. Nordell E, Kristinsdottir EK, Jarnlo GB, Magnusson M, Thorngren KG. Older patients with distal forearm fracture. A challenge to future fall and fracture prevention. Aging Clin Exp Res. 2005 Apr. 17(2):90-5. [Medline]. Mulherin D, Williams S, Smith JA, Edwards J, Sheeran TP, Price T. Identification of risk factors for future fracture in patients following distal forearm fracture. Osteoporos Int. 2003 Sep. 14(9):757-60. [Medline]. Lofthus CM, Frihagen F, Meyer HE, Nordsletten L, Melhuus K, Falch JA. Epidemiology of distal forearm fractures in Oslo, Norway. Osteoporos Int. 2008 Jun. 19 (6):781-6. [Medline]. Øyen J, Gjesdal CG, Brudvik C, Hove LM, Apalset EM, Gulseth HC, et al. Low-energy distal radius fractures in middle-aged and elderly men and women--the burden of osteoporosis and fracture risk : A study of 1794 consecutive patients. Osteoporos Int. 2010 Jul. 21 (7):1257-67. [Medline]. Melton LJ 3rd, Christen D, Riggs BL, Achenbach SJ, Müller R, van Lenthe GH, et al. Assessing forearm fracture risk in postmenopausal women. Osteoporos Int. 2010 Jul. 21 (7):1161-9. [Medline]. Geissler WB, Freeland AE, Savoie FH, McIntyre LW, Whipple TL. Intracarpal soft-tissue lesions associated with an intra-articular fracture of the distal end of the radius. J Bone Joint Surg Am. 1996 Mar. 78 (3):357-65. [Medline]. Richards RS, Bennett JD, Roth JH, Milne K Jr. Arthroscopic diagnosis of intra-articular soft tissue injuries associated with distal radial fractures. J Hand Surg Am. 1997 Sep. 22 (5):772-6. [Medline]. Melone CP Jr. Articular fractures of the distal radius. Orthop Clin North Am. 1984 Apr. 15(2):217-36. [Medline]. Clayton RA, Gaston MS, Ralston SH, Court-Brown CM, McQueen MM. Association between decreased bone mineral density and severity of distal radial fractures. J Bone Joint Surg Am. 2009 Mar 1. 91(3):613-9. [Medline]. Koenig KM, Davis GC, Grove MR, Tosteson AN, Koval KJ. Is early internal fixation preferred to cast treatment for well-reduced unstable distal radial fractures?. J Bone Joint Surg Am. 2009 Sep. 91(9):2086-93. [Medline]. Reed MR, Murray JR, Abdy SE, Francis RM, McCaskie AW. The use of digital X-ray radiogrammetry and peripheral dual energy X-ray absorptiometry in patients attending fracture clinic after distal forearm fracture. Bone. 2004 Apr. 34(4):716-9. [Medline]. Metz S, Kuhn V, Kettler M, Hudelmaier M, Bonel HM, Waldt S. Comparison of different radiography systems in an experimental study for detection of forearm fractures and evaluation of the Müller-AO and Frykman classification for distal radius fractures. Invest Radiol. 2006 Sep. 41(9):681-90. [Medline]. Trumble TE, Culp RW, Hanel DP, Geissler WB, Berger RA. Intra-articular fractures of the distal aspect of the radius. Instr Course Lect. 1999. 48:465-80. [Medline]. Aro HT, Koivunen T. Minor axial shortening of the radius affects outcome of Colles' fracture treatment. J Hand Surg Am. 1991 May. 16 (3):392-8. [Medline]. Catalano LW 3rd, Cole RJ, Gelberman RH, Evanoff BA, Gilula LA, Borrelli J Jr. Displaced intra-articular fractures of the distal aspect of the radius. Long-term results in young adults after open reduction and internal fixation. J Bone Joint Surg Am. 1997 Sep. 79 (9):1290-302. [Medline]. Cole RJ, Bindra RR, Evanoff BA, Gilula LA, Yamaguchi K, Gelberman RH. Radiographic evaluation of osseous displacement following intra-articular fractures of the distal radius: reliability of plain radiography versus computed tomography. J Hand Surg Am. 1997 Sep. 22 (5):792-800. [Medline]. Chaar-Alvarez FM, Warkentine F, Cross K, Herr S, Paul RI. Bedside ultrasound diagnosis of nonangulated distal forearm fractures in the pediatric emergency department. Pediatr Emerg Care. 2011 Nov. 27(11):1027-32. [Medline]. Douma-den Hamer D, Blanker MH, Edens MA, Buijteweg LN, Boomsma MF, van Helden SH, et al. Ultrasound for Distal Forearm Fracture: A Systematic Review and Diagnostic Meta-Analysis. PLoS One. 2016. 11 (5):e0155659. [Medline]. [Full Text]. Galletebeitia Laka I, Samson F, Gorostiza I, Gonzalez A, Gonzalez C. The utility of clinical ultrasonography in identifying distal forearm fractures in the pediatric emergency department. Eur J Emerg Med. 2017 Oct 13. [Medline]. Burstein AH. Fracture classification systems: do they work and are they useful?. J Bone Joint Surg Am. 1993 Dec. 75(12):1743-4. [Medline]. Jupiter JB, Fernandez DL. Comparative classification for fractures of the distal end of the radius. J Hand Surg Am. 1997 Jul. 22 (4):563-71. [Medline]. Andersen DJ, Blair WF, Steyers CM Jr, Adams BD, el-Khouri GY, Brandser EA. Classification of distal radius fractures: an analysis of interobserver reliability and intraobserver reproducibility. J Hand Surg Am. 1996 Jul. 21 (4):574-82. [Medline]. Beaty JH, ed. Orthopaedic Knowledge Update 6. Rosemont, IL: American Academy of Orthopaedic Surgeons; 1999. 364. Rang M. The Story of Orthopaedics. Philadelphia: WB Saunders; 2000. 401-6. Palmer AK. Fractures of the distal radius. In: Green DP, ed. Operative Hand Surgery. New York. Churchill Livingstone. 1993: 932-7, 942-4. Chong AK, Tan DM, Ooi BS, Mahadevan M, Lim AY, Lim BH. Comparison of forearm and conventional Bier's blocks for manipulation and reduction of distal radius fractures. J Hand Surg Eur Vol. 2007 Feb. 32(1):57-9. [Medline]. Solgaard S. Function after distal radius fracture. Acta Orthop Scand. 1988 Feb. 59(1):39-42. [Medline]. Webb GR, Galpin RD, Armstrong DG. Comparison of short and long arm plaster casts for displaced fractures in the distal third of the forearm in children. J Bone Joint Surg Am. 2006 Jan. 88(1):9-17. [Medline]. Rikli DA, Kupfer K, Bodoky A. Long-term results of the external fixation of distal radius fractures. J Trauma. 1998 Jun. 44(6):970-6. [Medline]. Kulshrestha V, Roy T, Audige L. Dynamic vs static external fixation of distal radial fractures: A randomized study. Indian J Orthop. 2011 Nov. 45(6):527-34. [Medline]. [Full Text]. Wall LB, Brodt MD, Silva MJ, Boyer MI, Calfee RP. The effects of screw length on stability of simulated osteoporotic distal radius fractures fixed with volar locking plates. J Hand Surg Am. 2012 Mar. 37 (3):446-53. [Medline]. Graham TJ. Surgical correction of malunited fractures of the distal radius. J Am Acad Orthop Surg. 1997 Oct. 5(5):270-81. Trumble TE, Schmitt SR, Vedder NB. Factors affecting functional outcome of displaced intra-articular distal radius fractures. J Hand Surg Am. 1994 Mar. 19 (2):325-40. [Medline]. Altissimi M, Antenucci R, Fiacca C, Mancini GB. Long-term results of conservative treatment of fractures of the distal radius. Clin Orthop Relat Res. 1986 May. (206):202-10. [Medline]. Jupiter JB, Masem M. Reconstruction of post-traumatic deformity of the distal radius and ulna. Hand Clin. 1988 Aug. 4(3):377-90. [Medline]. Fernandez DL. Correction of post-traumatic wrist deformity in adults by osteotomy, bone-grafting, and internal fixation. J Bone Joint Surg Am. 1982 Oct. 64(8):1164-78. [Medline]. Palmer AK, Werner FW. 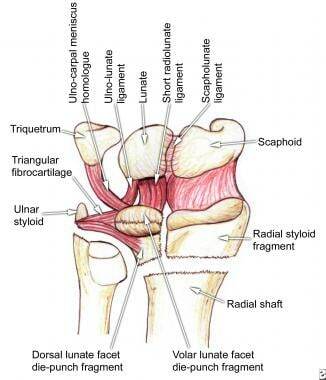 Biomechanics of the distal radioulnar joint. Clin Orthop Relat Res. 1984 Jul-Aug. (187):26-35. [Medline]. Villar RN, Marsh D, Rushton N, Greatorex RA. Three years after Colles'' fracture. A prospective review. J Bone Joint Surg Br. 1987 Aug. 69(4):635-8. [Medline]. Abbaszadegan H, Jonsson U, von Sivers K. Prediction of instability of Colles'' fractures. Acta Orthop Scand. 1989 Dec. 60(6):646-50. [Medline]. Trumble TE, Wagner W, Hanel DP, Vedder NB, Gilbert M. Intrafocal (Kapandji) pinning of distal radius fractures with and without external fixation. J Hand Surg Am. 1998 May. 23 (3):381-94. [Medline]. Lenoble E, Dumontier C, Goutallier D, et al. Fracture of the distal radius. A prospective comparison between trans- styloid and Kapandji fixations. J Bone Joint Surg Br. 1995 Jul. 77(4):562-7. [Medline]. Fernandez DL, Geissler WB. Treatment of displaced articular fractures of the radius. J Hand Surg Am. 1991 May. 16 (3):375-84. [Medline]. Pogue DJ, Viegas SF, Patterson RM, Peterson PD, Jenkins DK, Sweo TD, et al. Effects of distal radius fracture malunion on wrist joint mechanics. J Hand Surg Am. 1990 Sep. 15 (5):721-7. [Medline]. Short WH, Palmer AK, Werner FW, Murphy DJ. A biomechanical study of distal radial fractures. J Hand Surg Am. 1987 Jul. 12 (4):529-34. [Medline]. Kozin SH, Wood MB. Early soft-tissue complications after distal radius fractures. Instr Course Lect. 1993. 42:89-98. [Medline]. Knirk JL, Jupiter JB. Intra-articular fractures of the distal end of the radius in young adults. J Bone Joint Surg Am. 1986 Jun. 68(5):647-59. [Medline]. Axelrod TS, McMurtry RY. Open reduction and internal fixation of comminuted, intraarticular fractures of the distal radius. J Hand Surg Am. 1990 Jan. 15 (1):1-11. [Medline]. Bradway JK, Amadio PC, Cooney WP. Open reduction and internal fixation of displaced, comminuted intra- articular fractures of the distal end of the radius. J Bone Joint Surg Am. 1989 Jul. 71(6):839-47. [Medline]. Young BT, Rayan GM. Outcome following nonoperative treatment of displaced distal radius fractures in low-demand patients older than 60 years. J Hand Surg Am. 2000 Jan. 25 (1):19-28. [Medline]. Llinas A, McKellop HA, Marshall GJ, Sharpe F, Kirchen M, Sarmiento A. Healing and remodeling of articular incongruities in a rabbit fracture model. J Bone Joint Surg Am. 1993 Oct. 75 (10):1508-23. [Medline]. Özkan S, Westenberg RF, Helliwell LA, Mudgal CS. Distal Radius Fractures: Evaluation of Closed Reduction and Percutaneous Kirschner Wire Pinning. J Hand Microsurg. 2018 Dec. 10 (3):134-138. [Medline]. Naidu SH, Capo JT, Moulton M, Ciccone W 2nd, Radin A. Percutaneous pinning of distal radius fractures: a biomechanical study. J Hand Surg Am. 1997 Mar. 22 (2):252-7. [Medline]. Greatting MD, Bishop AT. Intrafocal (Kapandji) pinning of unstable fractures of the distal radius. Orthop Clin North Am. 1993 Apr. 24(2):301-7. [Medline]. Rayhack JM. The history and evolution of percutaneous pinning of displaced distal radius fractures. Orthop Clin North Am. 1993 Apr. 24(2):287-300. [Medline]. McBirnie J, Court-Brown CM, McQueen MM. Early open reduction and bone grafting for unstable fractures of the distal radius. J Bone Joint Surg Br. 1995 Jul. 77(4):571-5. [Medline]. Leung KS, Shen WY, Leung PC, Kinninmonth AW, Chang JC, Chan GP. Ligamentotaxis and bone grafting for comminuted fractures of the distal radius. J Bone Joint Surg Br. 1989 Nov. 71 (5):838-42. [Medline]. Putnam MD, Fischer MD. Treatment of unstable distal radius fractures: methods and comparison of external distraction and ORIF versus external distraction-ORIF neutralization. J Hand Surg Am. 1997 Mar. 22 (2):238-51. [Medline]. Alluri R, Longacre M, Pannell W, Stevanovic M, Ghiassi A. Volar, Intramedullary, and Percutaneous Fixation of Distal Radius Fractures. J Wrist Surg. 2015 Nov. 4 (4):292-300. [Medline]. Wolfe SW, Austin G, Lorenze M, Swigart CR, Panjabi MM. A biomechanical comparison of different wrist external fixators with and without K-wire augmentation. J Hand Surg Am. 1999 May. 24 (3):516-24. [Medline]. Davenport WC, Miller G, Wright TW. Wrist ligament strain during external fixation: a cadaveric study. J Hand Surg Am. 1999 Jan. 24 (1):102-7. [Medline]. Bartosh RA, Saldana MJ. Intraarticular fractures of the distal radius: a cadaveric study to determine if ligamentotaxis restores radiopalmar tilt. J Hand Surg Am. 1990 Jan. 15 (1):18-21. [Medline]. Axelrod T, Paley D, Green J, McMurtry RY. Limited open reduction of the lunate facet in comminuted intra-articular fractures of the distal radius. J Hand Surg Am. 1988 May. 13 (3):372-7. [Medline]. Kozin SH, Wood MB. Early soft-tissue complications after fractures of the distal part of the radius. J Bone Joint Surg Am. 1993 Jan. 75(1):144-53. [Medline]. Okazaki M, Tazaki K, Nakamura T, Toyama Y, Sato K. Tendon entrapment in distal radius fractures. J Hand Surg Eur Vol. 2009 Aug. 34(4):479-82. [Medline]. Mehta SK, Dale WW, Dedwylder MD, Bergin PF, Spitler CA. Rates of neurovascular injury, compartment syndrome, and early infection in operatively treated civilian ballistic forearm fractures. Injury. 2018 Dec. 49 (12):2244-2247. [Medline]. Herndon JH. Distal radius fractures: nonsurgical treatment options. Instr Course Lect. 1993. 42:67-72. [Medline]. Dauzere F, Delclaux S, Pham TT, Rongières M, Mansat P. Combined median and ulnar nerve palsy complicating distal radius fractures. Orthop Traumatol Surg Res. 2018 Oct. 104 (6):871-875. [Medline]. Taleisnik J, Watson HK. Midcarpal instability caused by malunited fractures of the distal radius. J Hand Surg Am. 1984 May. 9 (3):350-7. [Medline]. The basic fragments of the Melone 4-part pattern consist of the radial styloid, dorsal lunate facet die-punch fragment, volar lunate facet die-punch fragment, and radial shaft. Note that displacement of the dorsal and/or volar lunate facet die-punch fragments also alters the anatomy of the sigmoid notch articular surface; thus, it has important consequences for forearm pronation and supination. Postsurgical lateral radiograph shows a good reduction of the fracture with a volar buttress plate. The normal radial inclination is 22°. The normal radial length (RL) is 12 mm, and the ulnar variance (UV) is usually neutral or negative (normal, 0-1 mm). Lateral radiographic view demonstrates the volar tilt (normal, 11°). Closed reduction, fracture manipulation, and motion arthroplasty of the sigmoid notch were performed under a local hematoma block. Note the flat surface of the splint along the volar distal forearm to achieve 3-point molding of the sugar-tong plaster splint. Postreduction posteroanterior (PA) view demonstrates an adequate stable reduction of fracture fragments; thus, surgical intervention was not required. "Six-pack" exercises as Palmer describes, are performed during the period of immobilization to encourage and maintain finger motion. Safe pin placement is possible on the dorsal distal radius between the first and second, third and fourth, and/or fourth and fifth extensor compartments. * AR indicates arthroscopic reduction; BG, bone grafting of void (eg, iliac crest bone graft, allograft, bone graft substitute); CR, closed reduction; OR, open reduction; PP, percutaneous pinning. † Closed reduction with manipulation should be attempted on all displaced fractures, and surgery should be considered only in cases of inadequate closed reduction or loss of reduction with splint immobilization. ‡ Can be considered separately or in combination with other intra-articular fractures.